Cheniere is a leader in the LNG business. LNG - a hot stock since early 2016. A bullish pattern since 2008 in CQP. Both stocks have a promising future. The natural gas business in the United States has experienced tremendous growth over the past years. The supply side of the fundamental equation has been overwhelmed by massive reserves of the energy commodity from the Marcellus and Utica shale regions of the United States leading to record output. The demand side has soaked up lots of the supplies with the switch from coal to natural gas in power generation and liquification of the gas for export to other areas of the world where the price is substantially higher. Cheniere Energy, Inc. (LNG) has been a leader in LNG and natural gas marketing. Cheniere Energy Partners L.P. (CQP) serves as the general partner of the company. Investors and traders have two choices when it comes to investing in the company. Both stocks have been rallying steadily over recent months as the business of shipping natural gas around the world has expanded. The prospects for LNG remain excellent, and both stocks are likely to continue their upward momentum. As the LNG business grows in the United States and natural gas in liquid form heads for delivery points all over the globe, Cheniere Energy, Inc.'s shares have been steadily appreciating since February 2016. 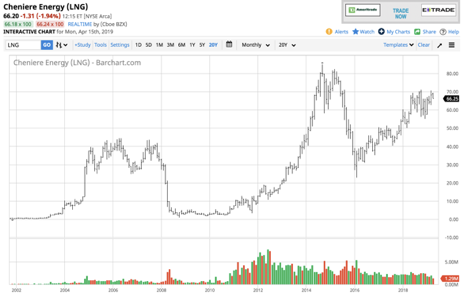 LNG shares traded to a low at 95 cents in 2008 and exploded to a high at an incredible $85 per share in September 2014. However, a bear market in commodities that caused the price of crude oil to fall to a low at $26.05 per barrel in early 2016 and natural gas to drop to its lowest price since the late 1990s at $1.611 in March 2016. The moves to the lows in the commodities took the price of LNG shares to a low at $22.80 in February 2016 as gravity hit the shares that appreciated by almost 90 times since the 2008 low. Since the 2016 low, LNG has made higher lows and higher highs reaching its most recent peak in early October 2018 at $71.03 per share. After a dip that took the price down to $55.09 in late December, LNG was a lot closer to the 2018 peak at $66.20 per share on Monday, April 15. The prospects for LNG continue to look bullish as the LNG business in the US is growing by leaps and bounds. LNG has a market cap of $17.039 billion at its current price while CQP's market cap stands at $21.08 billion as of the start of this week. While LNG has had a bumpy ride since 2008, the appreciation on CQP has been steady and a lot smoother. 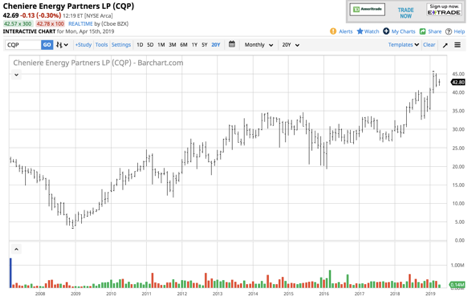 CQP's value in 2008 fell to a low at $3.65 per share, and the stock has made higher lows and higher highs in less volatile fashion when compared with LNG over the past eleven years, reaching a high at $45.27 in February 2019. The shares were trading on Monday, April 15, at $42.69 per share. LNG provided timely buyers with impressive capital growth on a percentage basis since 2008. Today, at the $66.20 level the stock remains attractive, but the current price to earnings multiple at 34.84 times earnings is high. At the same time, LNG does not pay a dividend to shareholders. CQP trades at 16.52 times earnings and pays a dividend of 5.55% as of April 15. CQP exchanges a dividend and smooth returns for the potential of more substantial percentage gains available from LNG. However, it has been a safer vehicle when it comes to performance for those who do not have perfect market timing when it comes to buying and taking profits. I believe that the LNG business in the US is currently just the tip of the iceberg when it comes to future potential and both LNG and CQG have lots of upside over the coming months and years. One thing to consider over the coming weeks is the news last week that Chevron Corporation (CVX) is paying $33 billion for Anadarko Petroleum Corporation (APC). Given their position in the LNG market, LNG and CQP with a market cap of around the $20 billion level could be a candidate for a takeover if the CVX-APC deal is the beginning of a period of consolidation in the energy business. With lots of cash at their disposal, a company like Exxon Mobil (NYSE:XOM) with a market cap of over $340 billion could swallow Cheniere in a heartbeat and create economies of scale for their business which also has its headquarters in Texas. There is a difference between an investment between LNG and CQP which is a trade-off when it comes to capital growth and dividend yield and share price volatility. However, that could all go out of the window if an 800-pound gorilla like XOM decides that the LNG franchise at Cheniere is world acquiring and both tickers could explode to the upside given the premium to purchase the company in the current environment.